Biologists have a rich array of quantitative tools for analyzing the genetics and evolution of traits, especially when the traits can be described by one or a few measurements. But describing some traits, such as gene expression profiles or life history patterns, is far more complex, often defined as a mathematical function of some other variable, such as body size as a function of age. A group of statisticians, mathematicians and biologists have formed a Working Group at the National Institute for Mathematical and Biological Synthesis to address the questions arising from the problem of analyzing complex evolutionary traits. The Darwinian Morpometrics: Cross-Topology Registration of Shape Working Group held its first meeting, Jan. 10-12, at NIMBioS on the University of Tennessee, Knoxville campus. Working Group co-organizers are Patrick A. Carter, associate professor of biology at Washington State University; Richard Gomulkiewicz, professor of biology and mathematics at Washington State University; David Houle, professor of biology at Florida State University; and J. Stephen Marron, professor of statistics at University of North Carolina, Chapel Hill. One fundamental challenge to understanding the evolution of function-valued traits is properly registering, or aligning, them while accounting for variation among individuals or taxa. This challenge is especially acute when considering morphological shapes, such as changes in form of fly wings. 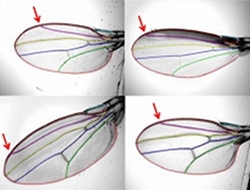 In Drosophila wings, for example, the shape the wing develops from a single sheet of cells on which self-perpetuating patterns of gene expression draw at least three separate types of functions. Each of the different functions occurs at a different time in development. To fully understand the evolution of the wings, it is necessary to understand what combination of these processes leads to differences in form. The group's goal is to develop a deeper understanding of the actual biological processes that underlie differences in form. Over the course of several years, the group plans to synthesize the development of appropriate hypotheses with new methods of registration to produce logical and systematic methods of analysis.